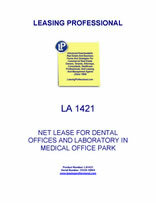 This lease form is for a dental office with related dental lab and office located in a medical office park. This dentist office lease utilizes a rent schedule for the specified minimum rent over the term of the lease. The lease is net in character, and the dentist office tenant is responsible for payment of its prorata share of operating costs for the medical office park. THIS LEASE AGREEMENT, made and entered into _______________, by and between ________________, a _________ limited partnership, doing business in _______________________ as Lessor, and ______________, as Lessee. ARTICLE 1. PREMISES. Lessor is the owner of real property situated in the City of ______________, ______________ County, State of _________, on which Lessor is developing an exclusive preplanned office and commercial park, known as the ______________, which real property is shown on Exhibit "A" and attached hereto and by this reference incorporated herein. Lessor hereby leases to Lessee and Lessee hereby leases from Lessor the certain premises in ______________ (hereinafter referred to as the "Premises" and "Park" respectively) outlined in red on the plat of ______________ attached hereto as Exhibit "A", said premises containing a total of approximately __________ square feet of floor space. The parties agree that this Lease is subject to the effect of any covenants, conditions, restrictions, easements, mortgages or deeds of trust, ground leases, rights of way and any other matters or documents of record; the effect of any zoning laws of the city, county and state where the Park is situated, and general and special taxes not delinquent. Lessee agrees that as to Lessee's leasehold estate Lessee and all persons in possession or holding under Lessee, will conform to and will not violate the terms of any covenants, conditions or restrictions of record which may now or hereafter encumber the Property (the "Restrictions"); and this Lease is subordinate to the restrictions and any amendments or modifications thereto. Future Amendments cannot hinder Lessee's use of the Premises. ARTICLE 2. PURPOSE. The Premises are to be used only for dental office for the practice of dentistry and ancillary laboratory and office use consistent with the Rules, Regulations and Restrictive Covenants attached hereto as Exhibit "C", and for no other purpose without the prior written consent of Lessor, which consent shall not be unreasonably withheld. ARTICLE 3. TERM. The term of this Lease shall be for ten (10) years three (3) months, unless terminated earlier as provided for herein, commencing ___________. Lessor agrees that it will, at its sole cost and expense and as soon as it is reasonably possible, commence and pursue the completion of the improvements to be erected by Lessor as shown on the attached Exhibit "D". Lessor shall deliver possession of the Premises to the Lessee one (1) week after full execution of this Lease for Lessee to enter and commence Lessee's required build out. Lessor shall have sixty (60) days after turn over of Premises to Lessee to complete its required work and to coordinate with the Power Company for any modifications. However, Lessee and Lessor both acknowledge Lessor has no control over the Power Company and its scheduling as noted in Exhibit "D" attached hereto. ARTICLE 4. POSSESSION. If Lessor, for any reason whatsoever, cannot deliver possession of the Premises to Lessee at commencement of the term hereof, this Lease shall not be void or voidable, nor shall Lessor be liable to Lessee for any loss or damage resulting therefrom, but in that event, all rent shall be abated during the period between the commencement of said term and the time when Lessor delivers possession. As such, rent shall commence upon delivery and the Lease term shall be extended by such period of delay. Rent shall be payable on or before the first day of each calendar month during the term hereof. Minimum rent for any partial month shall be prorated on a per diem basis. Lessee shall prepay one (1) month's rental upon signing of the Lease. Upon Lessee receiving its Certificate of Occupancy, Lessee shall prepay three (3) months rental to Lessor. These four months of prepaid rent shall be applied to minimum rent for the months of ____________________. Lessee's next minimum rent payment shall be due ______________, and thereafter on the 1st day of each month of the Lease term. Rent shall be paid to Lessor without deduction or offset, in lawful money of the United States of America and shall be paid at the office of Lessor at ______________, _________ or to such other place as Lessor may from time to time designate by written notice to Lessee. Any installment of rent, other sum or any portion of such installment or other sum required under this Lease to be paid by Lessee which has not been paid within ten (10) days written notice after the due date thereof (withstanding postal delays) shall, whether or not demand therefor is made or notice of default is given, bear interest at the rate of one and one half percent (1-1/2%) per month from the due date thereof or until paid in full. In addition thereto, Lessor may charge a sum equal to five percent (5%) of each unpaid amount as a service fee to compensate Lessor for the additional time and expense necessitated in the handling of delinquent payments. ARTICLE 6. USE OF PREMISES. Lessee shall not do or permit anything to be done in or about the Premises, nor bring or keep anything therein which will in any way increase the existing rate or affect any policy of fire or other insurance upon the Premises or any of its contents. Lessee shall not do or permit anything to be done in or about the Premises which will in any way obstruct or interfere with the rights of other lessees or occupants of the Park, injure or annoy them or use or allow the Premises to be used for any improper, immoral, or unlawful purpose. Nor shall Lessee cause, maintain or permit any nuisance in, on or about the Premises. Lessee shall not damage or deface or otherwise commit or suffer to be committed any waste in or upon the Premises. Lessee may use the Leased Premises only for the purpose of a dental office and laboratory with related office use. Lessee shall not place any sign or advertisement upon any exterior wall or window without the prior written consent of Lessor, which consent shall not be unreasonably withheld. ARTICLE 7. COMPLIANCE WITH LAW. Lessee shall not use the Premises or permit anything to be done in or about the Premises which will in any way conflict with any law, statute, ordinance or government rule or regulation now in force or which may hereafter be enacted or promulgated. Lessee shall at its sole cost and expense promptly comply with all laws, statutes, ordinances and governmental rules, regulations or requirements now in force or which may hereafter be in force and with the requirements of any board of fire underwriters or other similar body now or hereafter constituted related to or affecting the condition, use or occupancy of the Premises, excluding structural changes not related to or affected by Lessee's improvements or acts. The judgment of any court of competent jurisdiction or the admission of Lessee in an action against Lessee, whether Lessor be a party thereto or not, that Lessee has violated any such law, statute, ordinance or governmental rule, regulation or requirement, shall be conclusive of that fact as between Lessor and Lessee. Lessee hereby accepts the Leased Premises in the condition existing as the date of occupancy, and subject to Exhibit "D", subject to all applicable zoning, municipal, county and state laws, ordinances, rules, regulations, orders, restrictions of record, and requirements in effect during the term or any part of the term hereof regulating the Leased Premises. For purposes hereof, "Hazardous Materials" shall mean any and all flammable explosives, radioactive material, hazardous waste, toxic substance or related material, including but not limited to, those materials and substances defined as "hazardous substances", "hazardous materials", "hazardous wastes" or "toxic substances" in the Environmental Laws. For purposes hereof, "Environmental Laws" shall mean all local, state and federal laws, statues, rules and regulations, including but not limited to, the Comprehensive Environmental Response, Compensation and Liability Act of 1980, 42 U.S.C. Section 9601 et seq. ; the Hazardous Materials Transportation Act, 39 U.S.C. Section 1801, et seq. ; the Solid Waste Disposal Act, as amended by the Resource Conservation and Recovery Act, 42 U.S.C. Section 6901 et seq. ; the Federal Clean Water Act 33 U.S.C. Section 1251 et seq. ; the Clean Air Act 42 U.S.C. Section 7401 et seq. ; the Porter - Cologne Water Quality Act, including all amendments thereto, replacements thereof, and regulations adopted and publications promulgated pursuant thereto. Lessee agrees that during the term of this Lease Lessee shall not be in violation of any federal, state or local law, ordinance or regulation relating to industrial hygiene, soil, water, or environmental conditions on, under or about the Leased Premises including, but not limited to, the Environmental Laws. Lessee further agrees that during the term of this Lease, there shall be no use, presence, disposal, storage, generation, release, or threatened release of Hazardous Materials on, from or under the Leased Premises. Lessee agrees to indemnify, defend, protect and hold harmless Lessor, its directors, officers, employees, partners, and agents from and against any and all losses,, claims, demands actions, damages (whether direct or consequential), penalties, liabilities, costs and expenses, including all attorneys' fees and legal expenses, arising out of any violation or alleged violation of any of the laws or regulations referred to in this Article 7, or breach of any of the provisions of this Article. Lessee acknowledges complete responsibility for all Infectious Waste (as hereinafter defined) generated or originating on the Demised Premises, and covenants to adequately, properly and in conformance with all local, state and federal laws, rules and regulations handle, store and dispose of all such Infections Waste. For purposes of this Lease, Infectious Waste shall mean Bloodborne Pathogens, Regulated Waste and other potentially Infectious Materials as defined in the Code of Federal Regulations as amended from time to time. Lessee shall indemnify and hold Lessor harmless from any and all claims or damages arising out of Lessee's use or occupancy of the premises. ARTICLE 8. ALTERATIONS. Lessee shall not make or permit to be made any alterations, additions or improvements to or of the Premises or any part thereof without the written consent of Lessor, which consent shall not be unreasonably withheld, or delayed and any alterations, additions or improvements to, or on the Premises, except movable furniture and trade fixtures shall at once become a part of the realty and belong to Lessor. Lessee shall submit working drawings for any such alterations, additions or improvements to Lessor for Lessor's prior written approval. Lessor shall turn around Lessee's plans within one week after receipt. Lessor and Lessee acknowledge turn around does not necessarily mean approval. Lessor and Lessee acknowledge Lessee is to submit the final plans for Lessor's approval prior to Lease execution so that the final approved plans may be attached hereto and made a part of the Lease as Exhibit "F". Lessor and Lessee acknowledge Lessor has reviewed and commented on Lessee's plans and Lessee shall submit final plans to be attached to the Lease within a week of Lessee's execution of this Lease. Lessor hereby consents to the alterations, additions or improvements shown on Exhibit "F", attached hereto, and Lessor further agrees to complete any of Lessor's work, if any, specifically as shown on Exhibit "D". In the event Lessor consents to the making of any alterations, additions or improvements to the Premises by Lessee, the same shall be made by Lessee at Lessee's sole cost and expense and selection by Lessee of any contractor or person to construct or install the same shall be subject to the prior written approval of Lessor, which approval shall not be unreasonably withheld, and such work shall be performed in a workmanlike manner. Lessee shall keep the Premises and the Park in which the Leased Premises are situated, free from any liens arising out of any work performed, materials furnished or obligations incurred by Lessee. In the event a mechanic's or other lien is filed against the Leased Premises or the Park of which the Leased Premises forms a part as a result of a claim arising through Lessee, Lessor may demand that Lessee furnish to Lessor a surety bond satisfactory to Lessor in an amount equal to at least one hundred fifty percent (150%) of the amount of the contested lien, claim or demand, indemnifying Lessor against liability for the same and holding the Leased Premises free from the effect of such lien notice from Lessor. In addition, Lessor may require Lessee to pay Lessor's attorneys' fees and costs in participating in any action to foreclose such lien if Lessor shall decide it is to its best interest to do so. Lessor cannot step up and pay and expect reimbursement of such costs before Lessee's cure period is up unless Lessor is in a position where foreclosure proceedings have been indicated or Lessor is about to lose the property. (a) Lessee shall save original light fixtures and reinstall such in the original locations if Lessee vacates within the first five years, if Lessee vacates the premises after the initial five years, Lessor shall reinstall such fixtures at its sole cost and expense. All damage to the Leased Premises caused by the removal of such trade fixtures and other personal property that Lessee is permitted to remove under the terms of this Lease and/or such restoration shall be repaired by Lessee at its sole cost and expense prior to termination. ARTICLE 9. REPAIRS. Lessee shall, at all times during the term hereof, and at Lessee's sole cost and expense, keep, maintain and repair the Premises in good and sanitary order and condition, including, without limitation, replacement of all broken or damaged glass, replacement of light globes or tubes and doors, window casements, heating and air conditioning systems, plumbing, pipes, electrical wiring conduit, interior partitions, fixtures, leasehold improvements and alterations. Lessor shall, at its sole cost and expense, keep and maintain in good repair, the exterior walls and roof of the Premises. By entering into the Premises, Lessee shall be deemed to have accepted the Premises in "as-is" condition and as being in good and sanitary order, condition and repair, and Lessee agrees that on the last day of said term or sooner termination of this Lease to surrender the Premises with appurtenance in the same condition as when received at lease commencement reasonable use and wear thereof and damage by fire, act of God or by the elements is excepted. Both parties acknowledge "as-is" includes Lessor's scope of work as described in Exhibit "D". Lessor shall pay for maintenance and repair as defined herein so long as the need for same does not result from any wrongful or negligent act or omission of Lessee or its employees, invitees or licensees. The cost of any such maintenance, repair, janitorial or other service which becomes necessary as a result of any such act or omission shall be borne by Lessee. Lessor shall not be required to make any repairs unless and until Lessee has notified Lessor in writing of the need for such repairs except in emergency cases and Lessor shall have a reasonable period of time thereafter within which to commence and complete said repairs. Lessor shall act within seventy-two (72) hours after receipt of written notice and shall pursue to completion with due diligence; provided however, Lessor shall not be liable for any damages, direct, indirect or consequential, or for damages for personal discomfort, illness or inconvenience of Lessee by reason of failure of such equipment facilities or systems or reasonable delays in the performance of such repairs, replacements and maintenance, unless caused by the deliberate act or omission of Lessor, its servants, agents, or employees or anyone permitted by it to be in the Park, or through it in any way, the cost of the necessary repairs, replacements or alterations shall be borne by Lessee who shall pay the same to Lessor on demand. Unless such necessary repairs, replacements or alterations are Lessor's obligation, then the cost shall be borne by Lessor. Lessee shall have the right to cure any Lessor default under this Article and charge Lessor for such expenses, including fifteen percent (15%) to cover overhead which demand for payment from Lessor shall be paid within thirty (30) days of demand.